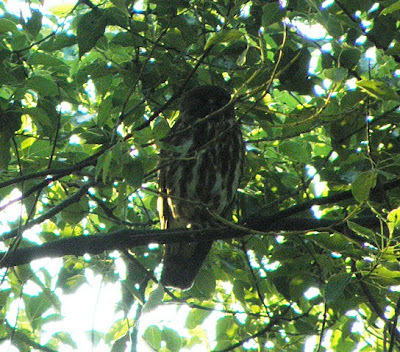 Local Name (Japan): Ao-ba Zuku (アオバズク) - "Green-Leaf Owl"
The Northern Boobook is another Japanese species which has recently been split from another species, in this case the Brown Hawk Owl. From my limited experience of it, it seems to be a fairly common owl that is found in parkland in addition to its normal rural habitat. It is found through East Asia - from Siberia, China, Korea, Japan and Taiwan. Unlike all of the European Owls, it apparently is an aerial hunter of insects rather than catching things on the ground. JAPAN - A reasonably common Summer migrant. - KYOTO/OSAKA 2013 TRIP: A single bird at Kyoto in the Imperial Palace Gardens.